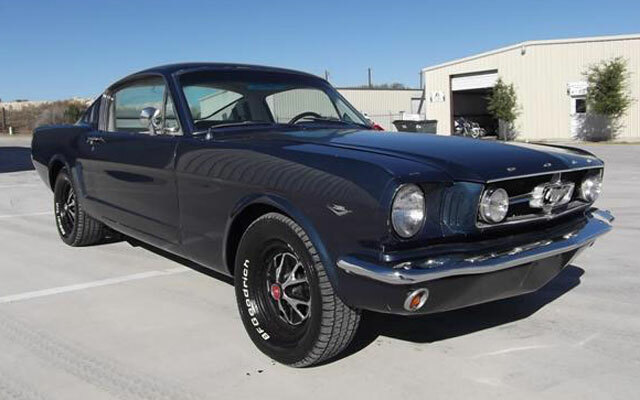 A 1965 Mustang GT Fastback for sale on the Cars-On-Line.com website is this week’s Deal of the Day. That’s what the Cars-On-Line.com newsletter says today. Published every Friday, the Cars-On-Line.com newsletter is the collector car hobby’s leading news source. This 1965 Mustang GT Fastback for sale is priced at a discount to the average values prevalent in the collector car hobby today. When you find a sharp looking 1965 Mustang GT Fastback for sale such as this one from Excelsior, Minnesota, you have to take a second look. (Click through to the ad page to find out more about the sale and see more photos.) The reason it is scheduled to be the Deal of the Day on the Cars-On-Line.com website this Saturday is because of the price. The private seller from Minnesota is only asking $18,500. The seller says it is a solid Texas car with many factory options and after-market upgrades. He points out some problem areas in the photos on this classic Mustang. The photos reveal Deluxe Pony interior, Rally Pac gauges, reproduction Pioneer AM/FM cassette stereo and the popular fold-down rear seat. Pop the hood and you will find a 347 ci stroker motor with SVO aluminum heads and a ‘mild’ cam. There are a ton of upgrades on this one also. See the ad for a lengthy list to include Edelbrock Performer RPM intake manifold, steel headers, 2 1/2-inch stainless steel exhaust and more. It has a toploader 4-speed transmission with Hurst shift and Currie 9″ Posi rear end. It will be our DEAL of the DAY on Monday as the asking price is $18,500. It should be noted that buyers will want to have this car inspected. The seller was honest enough to show photos in the ad that indicate some body work is needed. In the photos it looks as though it might be limited to small areas of the car. But having it inspected would be a better gauge for rust spots on the car. Still, for this price, you might expect the car to need some TLC. You’ll fnd the DEAL of the DAY preview each week in the Cars-On-Line.com newsletter. It gives you first shot at all the cars that will be highlighted in the DEAL of the DAY feature on the Cars On Line home page. Often these cars sell in the newsletter before they even make it to the home page! You’ll always see them here first though. Click here to view all of the coming week’s DEALs of the DAY.